More information: For over forty years Gordon has enjoyed the well-deserved reputation as one of Britain’s greatest guitar players. He made his first recordings in the 1960s as a folk artist, but by late 70s he had crossed into the Progressive Rock genre. 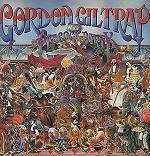 A trio of albums on the Electric Records label earned Gordon much praise and an ever-increasing fan base. In 1979 the album “The Peacock Party” was released on the PVK label. The tunes by Gordon are based on characters from the book "The Peacock Party" written by George E Ryder and illustrated by Alan Aldridge. This was a sequel to the somewhat better known "Butterfly Ball and the Grasshopper's Feast". Aldridge designed many well-known covers for rock albums in the 1970s including "Captain Fantastic and The Dirt Brown Cowboy" for Elton John. “THE PEACOCK PARTY” saw Gordon backed by a band of outstanding musicians such as JOHN G. PERRY (Bass), ROD EDWARDS (keyboards), RIC SANDERS (violin) and IAN MOSLEY (drums) and featured many outstanding tracks. This edition is newly remastered from the original tapes and includes four bonus tracks. The reissue also features a lavishly illustrated booklet with new essay and interview.